Tin House Books, 9781935639381, 342pp. Hot Art traces Joshua Knelman's five-year immersion in the shadowy world of art theft, where he uncovers a devious game that takes him from Egypt to Los Angeles, New York to London, and back again, through a web of deceit, violence, and corruption. With a cool, knowing eye, Knelman delves into the lives of professionals such as Paul, a brilliant working-class kid who charmed his way into a thriving career organizing art thefts and running loot across the United Kingdom and beyond, and LAPD detective Donald Hrycyk, one of the few special investigators worldwide who struggle to keep pace with the evolving industry of stolen art. As he becomes more and more immersed in this world, Knelman learns that art theft is no fringe activity--it has evolved into one of the largest black markets in the world, which even Interpol and the FBI admit they cannot contain. In this battle, the thieves are winning. Sweeping and fast-paced, Hot Art is a major work of investigative journalism and a thrilling joyride into a mysterious criminal world. Joshua Knelman is an award-winning journalist and editor. He was a founding editorial member of "The Walrus" magazine, and his writing has appeared in "Toronto Life," "Saturday Night," the "National Post," and the "Globe and Mail." Knelman s feature article Artful Crimes, published in "The Walrus," won a gold National Magazine Award. Knelman is also the coeditor of "Four Letter Word: New Love Letters," which has sold in ten countries. 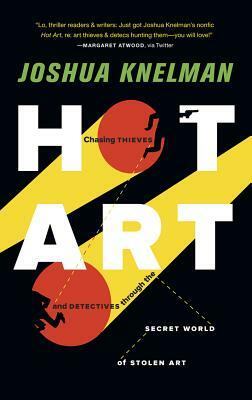 "Joshua Knelman's Hot Art is a work of nonfiction, and compared to the literary or cinematic realm of art theft and thieves, the truth is grittier, quirkier, and far more interesting." "Joshua Knelman exposes thieves, detectives, and collectors obsessed with Hot Art (Tin House)." "Your spring non-fiction reading.... deep thoughts on the nature of man.... Through interviews with cops, FBI agents, and a prominent former smuggler, [Knelman] shows how corrupt dealers (and public indifference) have helped this nearly unpoliced form of criminal activity become so pervasive"
"...Knelman makes shrewd use of extensive interviews with figures on both side of the law, allowing him to fully establish this hidden, high-stakes milieu...Engaging expose of an underground world...."
"Knelman takes readers on a fascinating journey through a criminal underworld that defies logic and confounds policing agencies from Los Angeles to Scotland Yard....Knelman [is] a born storyteller..."
"Knelman is a brilliant narrative writer and reporter who has assembled a cast of oddball sleuths and crooks rich enough to people five TV series. He takes us inside a huge and growing region of the global underworld. A thrilling read." "...fascinating and gripping from start to finish....a look into the real world of art." "Hot Art: Chasing Thieves and Detectives through the Secret World of Stolen Art creeps up on you. Wickedly entertaining.... Joshua Knelman’s in-depth investigation of the international trade in stolen art may read like a TV crime novel, but it delves deeper than that, deftly allowing art theft to serve as an extended metaphor for exploitive, unregulated, free-for-all global capitalism." "let me know when your book hits the shelves and i'll go and shoplift myself a copy." "Lo, thriller readers & writers: Just got Joshua Knelman's nonfic Hot Art, re: art thieves & detecs hunting them - you will love!" "With an eye for detail worthy of Rembrandt's Landscape with Cottages (1654, stolen from the Montreal Museum of Fine Arts in 1972), Joshua Knelman has painted a luminous portrait of the interconnected world of thieves, cops, and lawyers obsessed with stolen art. Whether he's writing about those who covet the art or those who protect it, Knelman's gifts as an investigator and storyteller drip from every page. Hot Art? Hot book." "This is a crackerjack of a book--with enough rogues, thieves, and amoral civilians (not all of them on the radar of relentless cops) to people a dozen crime novels. First-rate." "Now this is investigative reporting. Dogged, fearless, and thrillingly thorough, Joshua Knelman becomes our Virgil through the secret underworld of stolen art. Like legendary muckrakers Bob Woodward, Seymour Hersh, and Barlett and Steele, Knelman relentlessly trails both the bad guys and the slightly less bad guys, looking for truth amidst all the deceit. It's an astonishing debut, and serious readers must take note--long-form reporting has a new title in the canon." "Knelman's book is the Godfather of investigative journalism. He takes us to places we always wanted to be but didn't dare to enter, he makes us fall for people we are not supposed to love--on both side of the law. Congratulations, this is haute art!"